Here is an animated gif of Sol. It is comprised of a small sampling of the first ten images shown in this series as taken between December 9th thru 18th, 2013. Though the start of this new series of solar images was not as impressive as the start of "Series 1", the use of Stellarvue Nighthawk's 80/ 560 fine optics provides a larger image, thereby revealing a bit more detail in the full size shots. Not a bad tradeoff from the Scopos! To check out the available images of Sol taken by Mel Dawson, by placing your mouse over the "Solar Obs Series 2 Pages" button and clicking on the date range of your choice from the drop-down list. 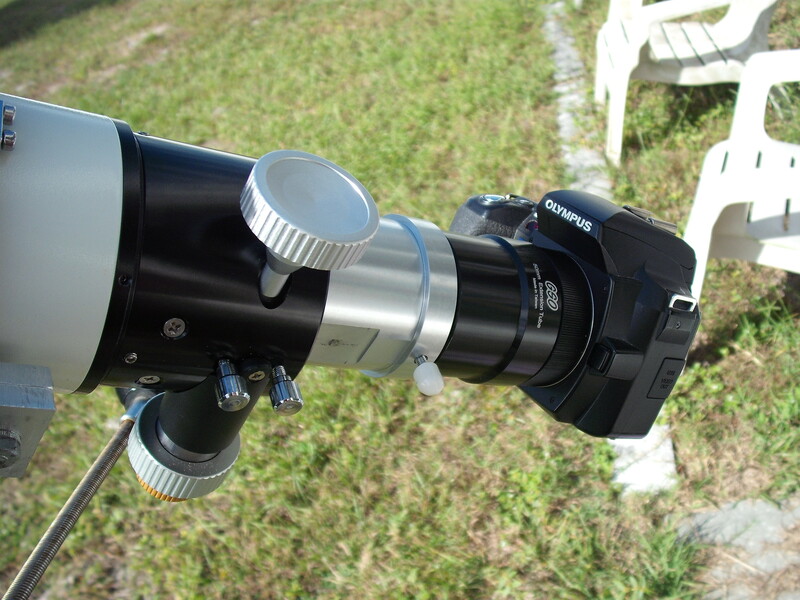 With the acquisition of a StellarVue SV80ED 80mm f/7 "Nighthawk Next Generation" achromatic refractor in early 2013, I decided to utilize its slightly longer focal length and fine optics to replace the Scopos 80mm f/6 apochromat I owned, which I promised to my friend and colleague Gary Barabino once he visited me in December of 2013, to begin a new series of solar images. But, before doing so, I wanted to capture as many daily images with the Scopos 80/480 as possible before Gary's departure. (Gary and his wife Jane arrived at the VSC-2 here in Riverview, FL on the morning of 12/03/2013.) I managed to capture images with the Scopos and Olympus Evolt E-500 DSLR up until 12/05/2013, before handing the Scopos over to Gary to take back to the VSC-1 in Slidell, LA. With the advent of this new series of solar images, I look forward to posting better images with the Stellarvue SV80ED 80/560 and Olympus E-500 prime-focus combination. Despite possessing a doublet objective, the Stellarvue renders equally stunning CA-free views of Sol, along with a pinch of additional magnification. In moving to the Stellarvue refractor, I believe it is going to foster a really nice collection of solar images for quite some time to come. Unfortunately, as with the previous series of solar images, there will be days when the weather conditions may not be favorable to allow me to get an image for one day, or even a run of days like I experienced between December 27, 2013 thru December 30, 2013. I hope these gaps will be far and few. In any case, despite the short falls, i hope everyone visiting this collection of images will fine them inspiring and satisfying. For i do this for all who shares the great indulgence of amateur astronomy. Now, let's discuss the method I used to get these images. One might think that this huge collection of images may have been put together with great effort. Au contraire! Actually, once I developed my method, it only took no more than 15 minutes to setup, get my series of images to choose from, and have one ready for posting. The DSLR camera settings established for my particular setup are as follows: Manual selection on the main dial -- Shutter Speed: 1/640th and 1/640th of a second -- ISO: 100 -- Image Quality: SHQ -- White Balance: 0. One of these days, I will post a video that shows the steps I go through to capture my shots. In the meantime, please enjoy checking out the photos of Sol I have posted by placing your mouse cursor over the "Sequential Solar Obs Pages" button shown above and clicking on the date range of interest from the drop-down list. All of the solar images shown on the follow pages in this series were captured from my backyard using the new StellarVue SV80ED/ Olympus setup pictured above. 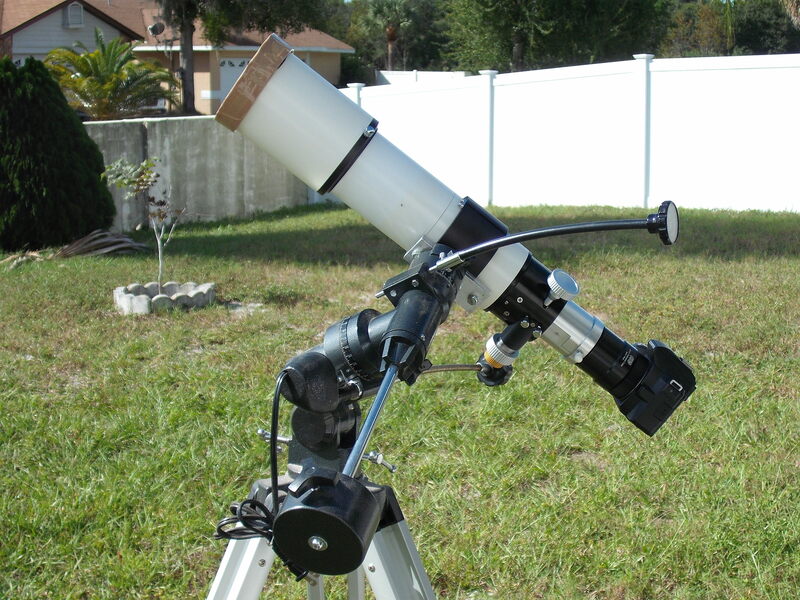 The first picture is of the west side of the StellarVue SV80ED Nighthawk 80mm f/7, Olympus Evolt E-500, and Baader homemade solar filter ready to capture the daily image. The next shot is the east side of the setup. The next is a full view facing west capturing the east side of the setup. The forth photo is a close-up of the Olympus Evolt e-500 attached to the StellarVue's Crayford focuser via a 2" T-Adapter and 2" 50mm extension tube. 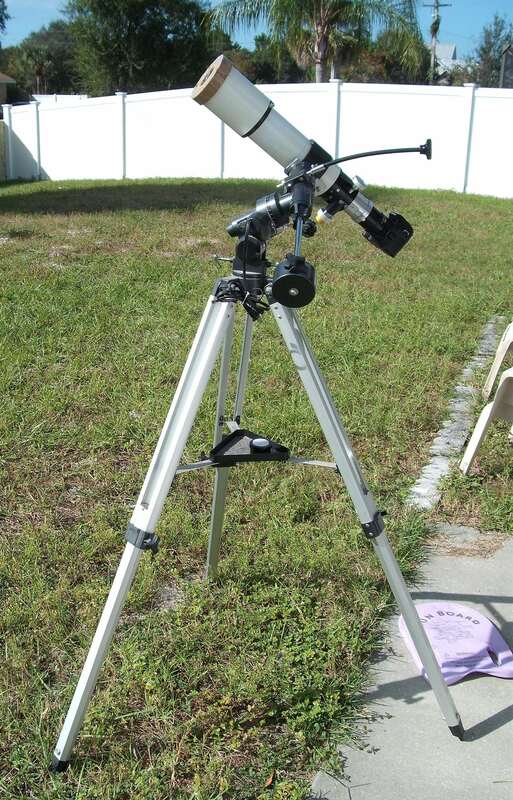 The last picture was taken of the setup from the rear facing the sun to the south southeast. Click each images to enlarge!